Photo by Brett Dunlap “Over Easy” by Paul Emory of Zanesville is one of the ostrich eggs used as the “canvas” for artists to create unique works of art in the “Art 360: Contemporary Art Hatching Across Ohio” exhibit on display at the Parkersburg Art Center. Photo by Brett Dunlap“Devolution of Evolution” by Marc Ross of Columbus was one of the ostrich eggs to create unique works of art in the “Art 360: Contemporary Art Hatching Across Ohio” exhibit on display at the Parkersburg Art Center. Photo by Brett Dunlap “Get Your Head Out of the Sand” by Rondie West of Cincinnati, Ohio, was one of the featured pieces in the “Art 360: Contemporary Art Hatching Across Ohio” exhibit on display at the Parkersburg Art Center. The artist cut open the egg and used found objects to build his piece. 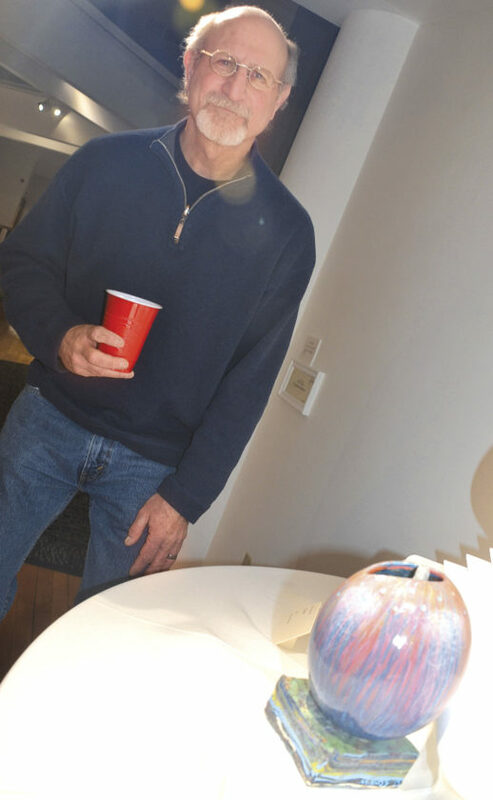 PARKERSBURG — A number of artists from around Ohio have utilized ostrich eggs in a variety of ways for an art exhibit on display at the Parkersburg Art Center. 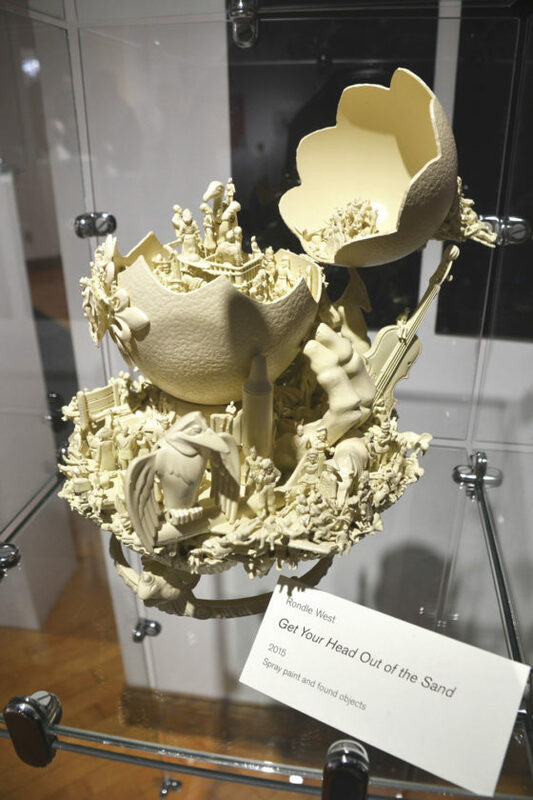 “Art 360: Contemporary Art Hatching Across Ohio” features 48 hand-detailed ostrich eggs across a number of different mediums done by 48 different artists. After five successful showing in museums across Ohio, the show has come to Parkersburg. The inspiration for the show was to give each artist the same object to see how 48 different artists would transform the same canvas using their own individual techniques and artistic vision, Bluestone said. The work on display features 24 different types of artistic media, including watercolor, oil, acrylic, printing, sculpture, fabric, found items, 3-D printing, light and more. “It touches on an incredible (variety) of different art forms,” Bluestone said. Some of the artists, which have a wide variety of ages, were inspired by such influences as musical composition, anime, video games and more. Techniques range from the use of beeswax to the use of 3-D printers. “You have over 2,000 years of artistic techniques just in this show,” Bluestone said. The scope of the exhibit is different than work done on a canvas. “With Art 360, the artist has to go around the egg so the challenge is how does the artist resolve the painting,” Bluestone said. In addition to the eggs, a number of local artists painted a number of pieces hanging on the walls behind the eggs which took inspiration from the egg works themselves in order to complement them. 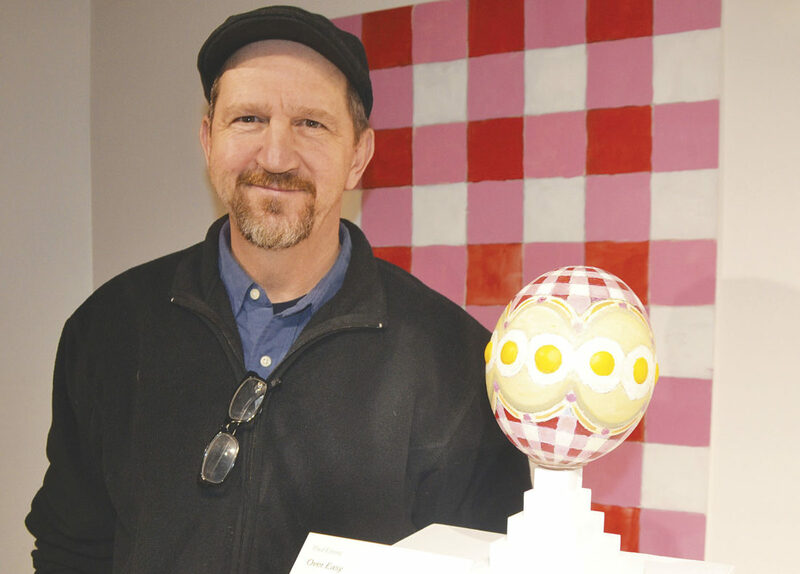 “They selected works they found inspiring and created backdrops to mirror what was going on with the eggs,” Bluestone said. One piece, “Over Easy” by Paul Emory of Zanesville, Ohio, showcases a representation of egg platter works he had painted in the past. The work features oil paintings of a dozen eggs, sunnyside up, on a tablecloth motif, on top of acrylic. Like most artists, Emory always sees different ways he could have done it. Another piece, “Devolution of Evolution” by Marc Ross of Columbus involved the artist cutting open an egg and creating a cave motif inside using sculpture and painting. Ross said the inspiration was holding the ostrich egg which got him thinking what it might have felt like to hold a dinosaur egg. “They are huge and they are heavy,” he said. He admits he is more of a painter and not much into sculpture, but he wanted to do a sculptural piece inside and outside. The base on which his eggs sits is a collection of six to seven years of old paint collected in a bucket. He cut it out and the design reminded him of geological striations. He admits this will probably be a one-of-a-kind piece for him. However, a lot of his work is non-representational which is reflected in a lot of different aspects of his egg. “This is a one-time thing for me,” Ross said with a laugh. “It was a real challenge for me to do. Being Easter season with people thinking about Easter eggs, Bluestone hopes many children will come and see the exhibit. “Children will see these objects as Easter eggs,” he said. “Every kid can remember dipping eggs into the colored dyes, but what they may not realize is that they are seeing fine art from some of the best artists working today. The exhibit is scheduled to remain on display until April 20 at the art center at Eighth and Market streets. It is open Wednesday through Saturday from 10 a.m. to 5 p.m. Daily admission is $2 for non-art center members, with no charge for children under 12.